The bite was good and bad last week on Central Tennessee’s Caney Fork. If you were a bait chucker the early morning and late evening yielded easy hookups. Once the sun hit the water, on the other hand, the bite stalled. At that point, fly guys hammered the trout as the rainbows, brooks and browns began to key in on hatches. We spend portions of three days on the Caney filming Pautzke Outdoors with Joel Martin, owner of Big Rock Market, an institution that’s served the river for nearly 40 years. Armed with Balls O Fire salmon eggs, we paddled our way through nine miles of river to survey the scene. It didn’t take long to see how special this system is to anglers from the Nashville area. Fewer than an hour from famous Music Row and Downtown Nashville, this is the closest year-round trout fishery to the Music City and it gets an enormous amount of fishing pressure. Fortunately, trout stocking is modified to handle the pressure. The Caney receives 111,500 rainbow trout, 97,000 brown trout and 30,000 Brook trout annually from Dale Hollow National Fish Hatchery. A few extra plants come from the Tennessee Wildlife Resources Agency if they have any excess, which is fairly common. The rainbows are released at catchable size from March through December. Brooks are stocked at nine inches in May and June and browns go in from March to April and again in October and November at catchable and sub-catchable sizes. 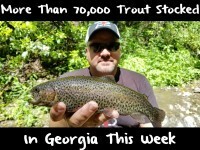 That’s a lot of trout, but more than necessary considering the number of anglers you’ll see scattered on the bank. On a busy weekend up to 500 canoes and kayaks can be seen over a 10-mile stretch, many of which are trout fishing. You’ll also find anglers littering the bank, fly guys in drift boats and dozens of fishermen wading in the gin clear water. Weekdays are recommended to avoid crowds. Keep in mind when targeting trout on the Caney its always best to do so when they aren’t generating water from Center Hill Dam. Generation makes the river swell and pushes a ton of water downstream, thus making the system difficult to fish. The schedule changes daily. You’ll need to call after 4pm each day to find out what’s planned for the next day. It can be a chore, but this is life on the Caney. Recreation isn’t considered when it comes to making power, or they’d simply only generate at night. If there are any generators on, it’s safest not to kayak/canoe and to stay out of the water. Bank fishing can even be a challenge, unless you’re at the base of the dam. Meanwhile, when the generators are off, it’s game on. There’s a mind-boggling number of trout in the Caney Fork. While we couldn’t get them to bite during peak sunlight hours, our polarized glasses enabled us to see thousands of them, in every hole from the dam on down nearly 10 miles. While we drifted from mile one to nine during the first two days the best action came when we focused our efforts near the dam. The base of the dam is home to a large amount of trout, both fresh planters and holdovers. They migrate to this area due to oxygenated water and lots of feed. With a small boat, canoe, kayak, etc, anglers can paddle/motor up to the falls and find excellent action. We spend mornings and evenings casting Gold Label, Silver Label and Yellow Jackets on size 10 Gamakatsu hooks along seam lines and found constant action. Simply cast into the current, let your bait drift and wait for the bobber to go down. Keep in mind, the water is gin clear. You’ll want to use four-pound test. We employed a Trout Magnet float and size BB Water Gremlin split shots to keep our baits a tad off the bottom and maintain a quality drift. This method yields constant action and an array of species and sizes. We caught all rainbow trout from eight inches towards three pounds. You’ll catch mostly rainbows this way. 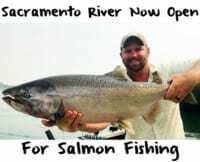 Meanwhile, if you want to catch browns, too, buy a bucket of night crawlers, pinch off half a crawler and add two salmon eggs. If you use this combo browns will bite it, too. From a kayak or canoe you’ll find endless holes to drift salmon eggs in. It’s no secret eggs are a big deal here and has been for decades. 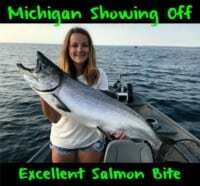 In fact, dough baits have fizzled out in recent years while premium style eggs like Gold Label, Silver Label, Yellow Jackets and Orange Deluxe have taken over. On the other hand, if you’re a bank angler there’s certain places that generate more success beginning with Long Branch and Buffalo Valley Recreation area at the base of Center Hill Dam. There’s plenty of bank access in the middle of a heavily planted section of water. Moving downriver there’s ample roadside access (but no facilities) along Highway 141. Roughly six miles downriver from the dam, Happy Hollow is a drive-to spot where and endless number of smaller trout are released. There’s also access at the I-40 Rest Area and then at Kirby Road, but after that trout become less available. The above-mentioned areas cover more than 10 miles. Editor’s Note: For updated release schedules for the Caney please call Big Rock Market 931-858-0967. They also rent kayaks/canoes for fishing and provide shuttle services as well as a full, on-site tackle shop.